Me! Presenting at WordPress Cheltenham meetup group. 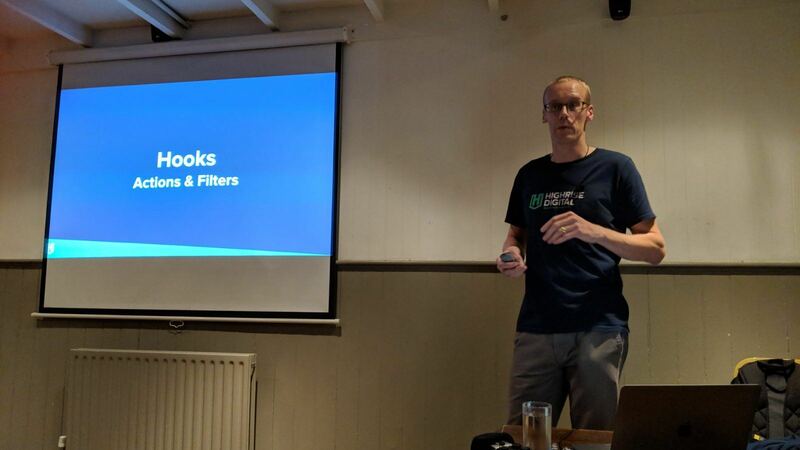 I was kindly invited to speak at the WordPress Cheltenham meetup this week and my talk was titled “How to write extensible WordPress code”. I have a really great time meeting new people and seeing some old friends from the WordPress community. It is a lovely, well-organised group and if you are in the area I can highly recommend that you get yourself down for the next meetup in October. View my slides on How to write extensible WordPress code. P.S. this was the first time I videoed my own talk and I was pleased with the outcome, apart from the audio which was a bit echoey. I think this was due to a last minute change in USB port for the camera and the recording software defaulted the audio input device to the wrong one (although I am not certain!). Hopefully get it better next time. Learn more about how to write extensible WordPress code by reading our guide to using WordPress hooks.